Revolv, a Boulder, Colo.-based company that has been building a hub for the smart home, has finally let its radio-packed machine out into the homes of reviewers. And unless you’re an early adopter with an iPhone who already has a select bunch of connected devices today, this isn’t the device for you. However, if you own a Sonos, a Nest, Yale Locks, Kwickset locks, the Philips Hue lightbulbs, Insteon products or a few other devices on this list, the Revolv might be worth the $299 asking price. Again, I say might, because if you have all of these devices and don’t have a desire to start playing with a limited feature set under one app (knowing that feature set is going to improve), then this isn’t for you. However, if you want to connect a lot of binary devices (on/off), then by all means buy this hub. That’s a lot of caveats, which feels harsh for a device that I think has a lot of promise. The challenge here for Revolv, for reviewers and for others, is that the idea behind a smart home is shifting, and doing so at such a rapid pace it’s hard to say exactly what the end user experience should be and how we should get there. My bias is for a simple-to-use-interface that can support a lot of devices and let me control their basic features on a day-to-day basis. 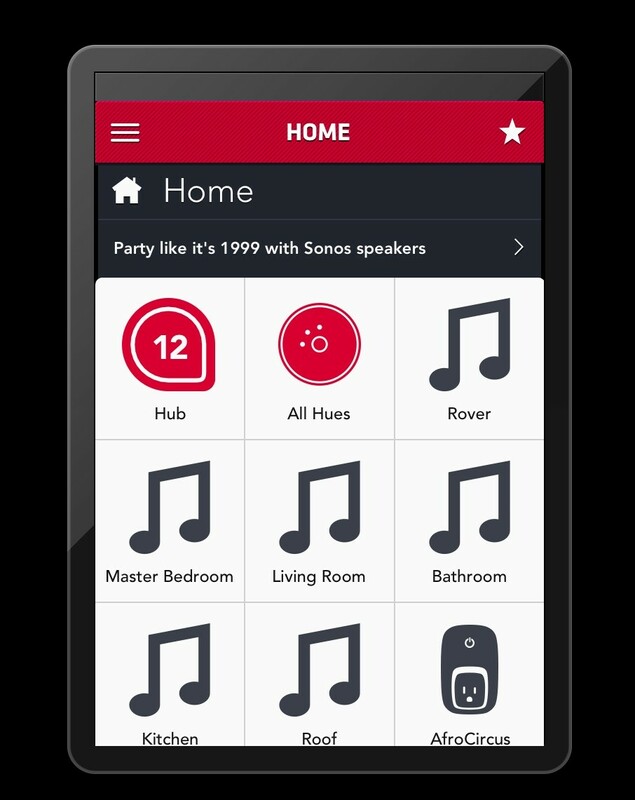 The challenge for these developers will be that what I consider a basic feature for my Sonos may not be the same feature my cousin uses constantly. The other challenge for Revolv will be working with the device maker to get as much support for features via the API as possible. My bias may not win out, but I like that Revolv shares that worldview. The hub is shipping today for those that pre-ordered it, and is available on Nov. 28 via Amazon; it contains seven radios including Wi-Fi, Z-Wave, ZigBee and Insteon. It uses your phone’s GPS to get your proximity so you can set up certain actions to happen when you get closer to your home (or leave it). However, for now it only supports iOS devices and works only on the 2.4 GHz band of your home Wi-Fi network. As an Android user I really missed out on a few features that aren’t available in my iPad. 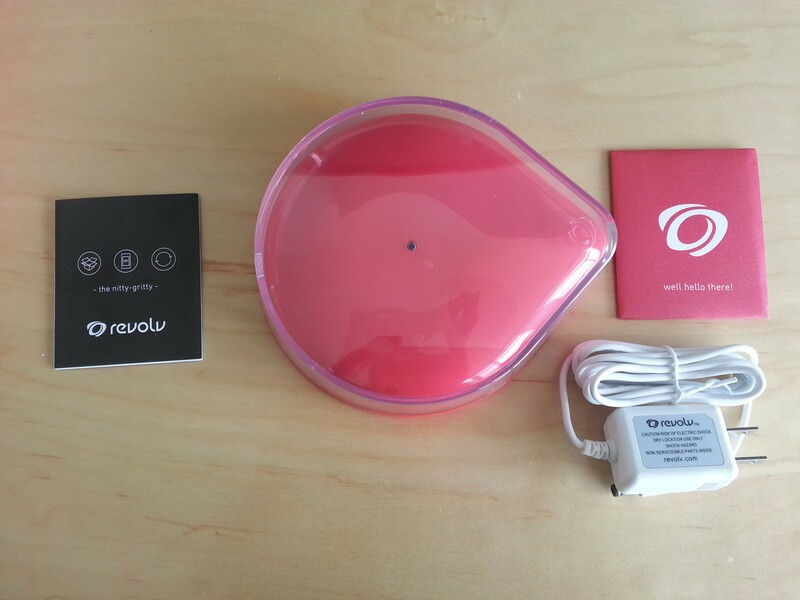 Set up is super simple, which is what Revolv is going for. You take out the hub, scan a QR code to get an app (or just download it) and plug the hub into the wall. Because it communicates through Wi-Fi you don’t have to plug it into a router using Ethernet, which was a plus for me, with other connected hubs jamming my four available ports. To get the Revolv onto the network you follow a simple process that includes entering your Wi-Fi network password, and culminates in you laying an iPad or iPhone(s aapl) on top of the hub and letting the camera flash communicate with it. Whatever the flashing signals, the end result is that your hub and the app on the Apple device are paired (yes, Android(s goog) is coming, but there’s no set date yet). Device recognition is also simple. The app recognized the Hue lights, my six Sonos bridges and my Belkin WeMo without me doing anything (to control the Hue lights from the app I did have to press the button on the Hue bridge). I also manually added my Kwikset door locks, which was a two-minute process. Adding locks takes a manual step as a security precaution. With all my devices onboard, it was time to play. Here’s where the Revolv experience stumbles. I could control my lamp plugged into the WeMo with a double click, but the delay between telling the app to do something and it happening could run up to five seconds. On top of that, when it comes to building little recipes (Revolv calls them actions) to combine devices or set them to take action based on time or my location (either home or away), the app struggled. First, setting up an action was a bit confusing. Once you select the option to create an action, you arrive at a screen with four pictographic options: motion, time, location and a gear that basically lets you double click on something to activate it. I found that final option confusing, because sometimes when I double clicked my WeMo icon from the home screen it would turn on/off the lamp plugged into it, but sometimes it would open up access to the device screen and I would then have to tap again to turn it back off/on. I also found creating the actions an uneven experience. 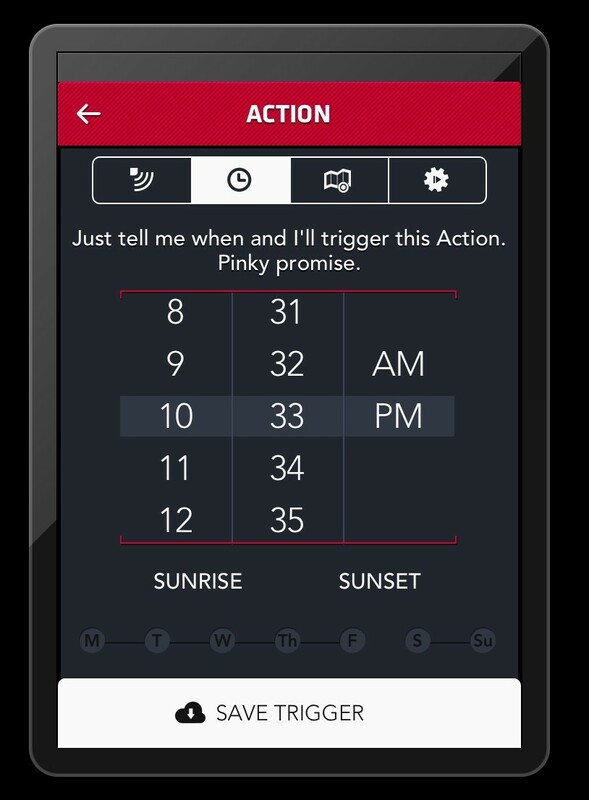 You select one of the four triggers, then define it and click a bar that says “Create Trigger.” The next step is to choose the device you want to add as part of that action. 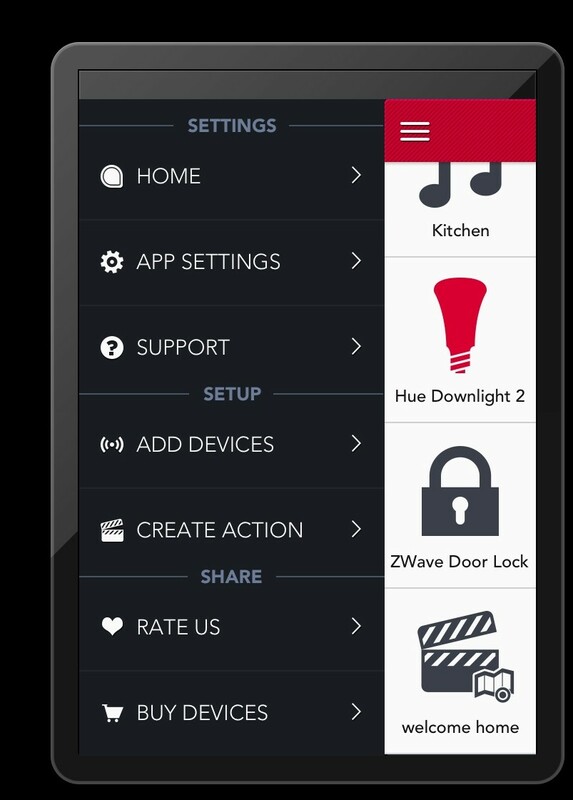 Once you choose a device you then have to set the specific action, such as turn my Hue lights blue. You can also name your action: Sometimes those saved, sometimes they didn’t. The final issue for me is that while I could manually trigger all of the recipes I set up, only one of the four happened automatically. When it came to the location triggers, my Wi-Fi-only iPad 3 doesn’t have GPS which means it couldn’t use the Revolv “GeoSense” technology to set the action in motion. So for now, iPhone users or iPads with GPS appear to be the only means to set a location trigger. The app did tell me it was unlocking my door when I entered the Wi-Fi network, without actually unlocking my door. However, when one of my two time-based triggers failed to occur I was frustrated. It turned out I had somehow changed the trigger signal without realizing it — or maybe it hadn’t saved properly. I expect a lot of this to get better over time, and hope Revolv can update the app issues quickly. On the hardware side, the hub is flexible and unobtrusive. My Z-Wave locks had a hard time reaching the hub from one floor up and about eight feet over, but perhaps if I had another Z-Wave based device on the network to act as a repeater that could help. All in all, this is a device that works well, but the software is a frustrating experience that requires a bit of learning (or maybe a software update). Luckily for Revolv, software can be updated, and the vision here is solid. I look forward to testing it again a few updates in and when it has Android support. I like the creativity this will offer me in setting up different interactions around my home and want to keep playing. Updated at 7:30 to reflect the ship date vs. Amazon availability. How do you compare this to Smartthings? Their website doesn’t list Nest as one of the supported devices.